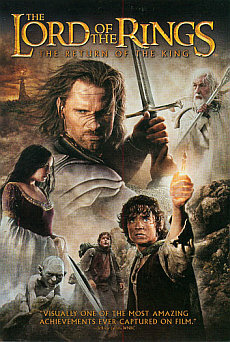 The theatrical version of "The Return of the King" was a complete triumph. Not only the film got recognition for the complete trilogy by receiving 11 Academy Awards. Also at the box office the film was success: the film with a running time of 3 hours and 20 minutes reached the 1 billion dollar mark. It was only logical that the SEE was a long-excpected event. Not only that the fans were eager for every bit of new scenes from the internet. 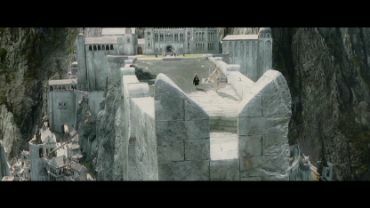 There were various rumours like an "Extended Extended Edition only for employees of New Line". So what does the SEE ultimately offer? 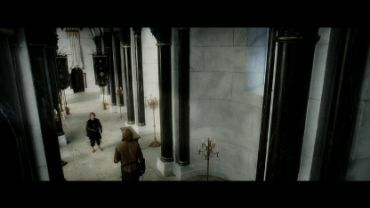 The Special Extended Version of RotK is actually a polarizing experience. 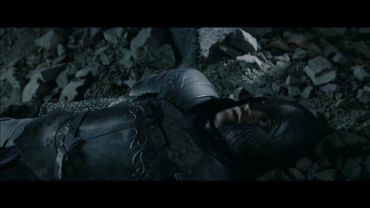 Some of the added scenes almost feel like they make the film worse. On the other hand, other scenes offer some beautiful dialogues straight from the book, as well as backgrounds and characterizations. On the third hand, there are also some "fillers". 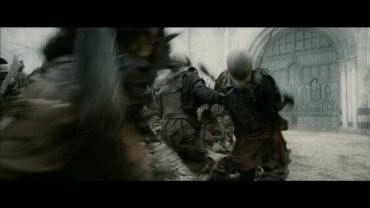 Also the violence of the Special Extended Edition has become slightly more, much like in the previous two films. 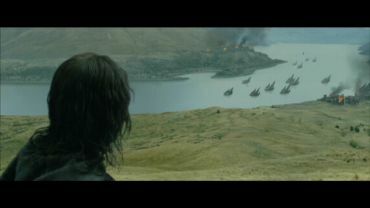 Although again, the age rating of the SEE is still the same PG-13. If nothing else is stated, the text refers to the SEE version. If both versions have different footage, the text about the SEE is listed first under SEE:, the text about the theatrical version is listed under Theatrical version:. Further remarks are listed in italics. (Brackets) mark the scenes preceeding or following the cut. Disc 1 contains 32 cuts. The SEE (Disc 1) is 0:28:54 Minutes longer (PAL time). 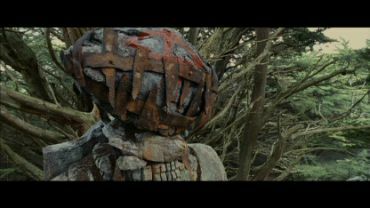 In case of slight re-editing, the nature of the recuts is mentioned in the context of the entire scene. 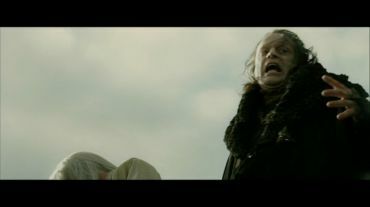 SEE: Sméagol strangles Déagol longer. 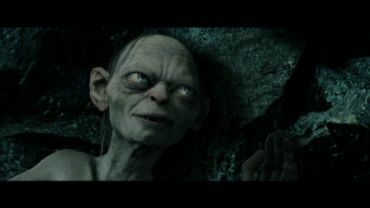 Déagol struggles, his feet tremble. 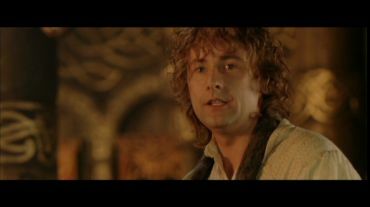 SEE: The dialogue by Merry and Pippin goes slightly longer. 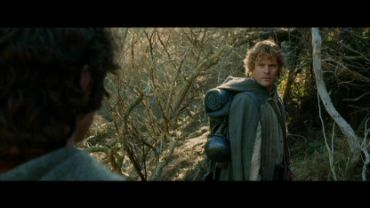 They discuss the quality of the Longbottom leaf from the Shire and go on talking. They look slightly drunk. Theatrical version: Here the dialog was trimmed down to just two lines. SEE: A new long scene, “Saruman’s Voice”. 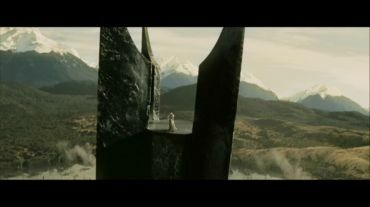 Saruman comes out on the top of the tower and proposes peace to Théoden. 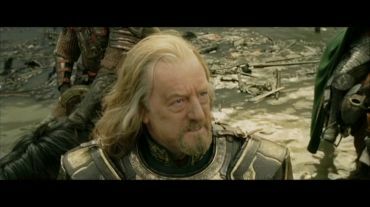 Théoden rejects his offer. 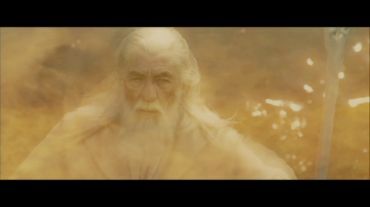 Saruman becomes upset and rude both towards him and Gandalf. 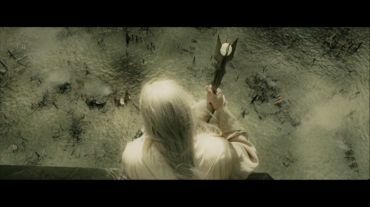 The latter asks Saruman about the plans of the Enemy. 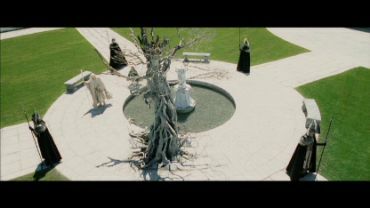 Saruman looks into his Palantir and says, that something is rotten in Middle-Earth, making an allusion to the madness of Denethor. 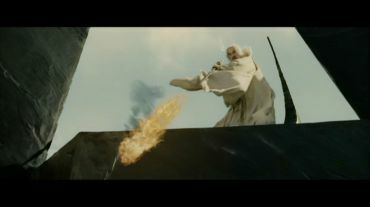 Gandalf promises him forgiveness, but Saruman gets angry and throws a fireball at him. 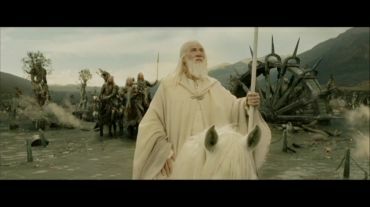 He fails however: Gandalf the White is invincible against Saruman’s magic. 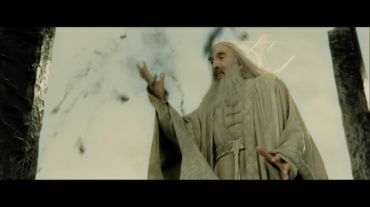 With his words, Saruman’s staff of the wizard breaks. 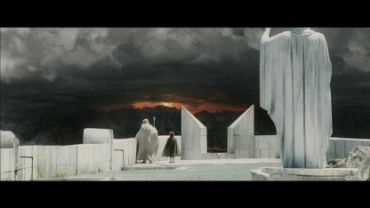 Gríma appears behind Saruman’s back and Théoden tries to convince him to get him back on his side. 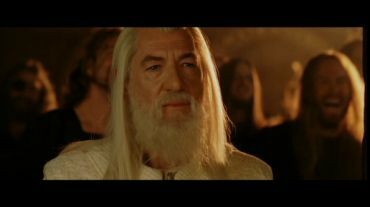 However, Saruman laughs at Gríma and beats him up. 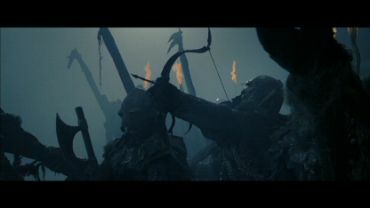 As he turns away from him, Gríma stabs him in the back and is subsequently shot by Legolas. 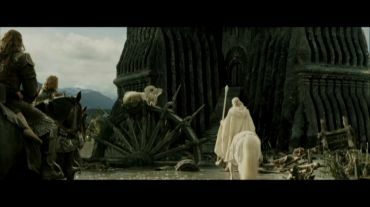 Saruman falls down from the tower and lands on a giant spiky wheel. 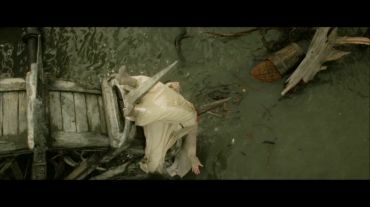 The wheel drags his corpse underwater; meanwhile, the Palantir slides out of his sleeve and falls into the water. 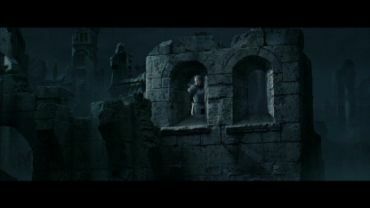 Theatrical version: Gandalf says that Saruman has to stay in the tower under the guard of Treebeard. 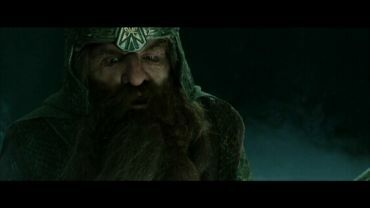 Gimli wants to have his head chopped off, but Gandalf assures him that his power has faded. This scene was cut out very short before the final theatrical cut and caused much protest. 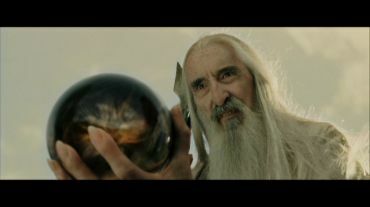 Christopher Lee was also disappointed when it was cut out – now it’s back. The scene contains some nice quotations from the book. 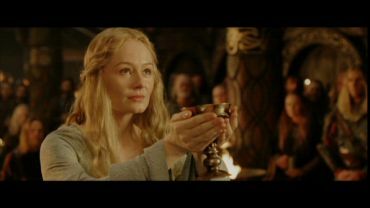 SEE: Éowyn handles a goblet to Théoden. 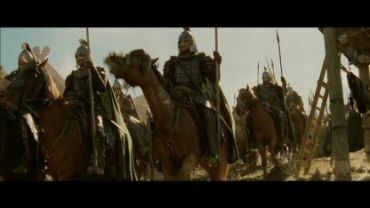 He raises it and Aragorn stands up, and all the other Rohirrim with him. 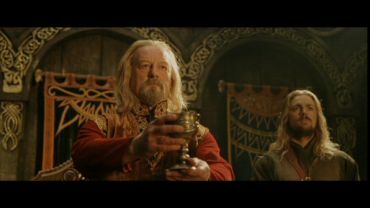 SEE: Éomer explains Legolas the rules of the drinking game, and Gimli adds: the last man who stands, wins. 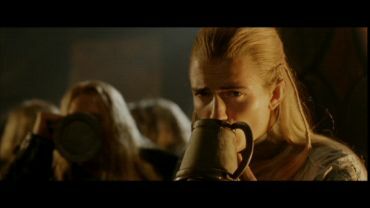 SEE: Gimli und Legolas continue drinking. 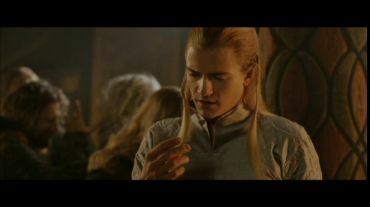 Legolas says that he feels a light itching in the fingertips. 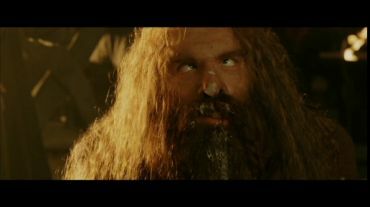 Gimli is already drunk; he yells that Legolas can’t hold his liquor and drops unconscious. 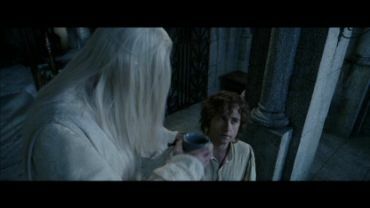 SEE: Gandalf claps his hands (different take), Pippin looks at him, hesitating. Merry calls him to pay attention and they dance to the end. 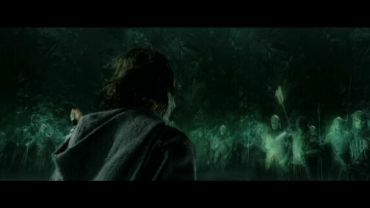 Theatrical version: Gandalf claps his hands, the hobbits finish their song. 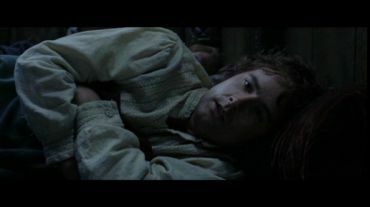 SEE: Gimli is sleeping after the heavy drinking; Pippin is lying awake. 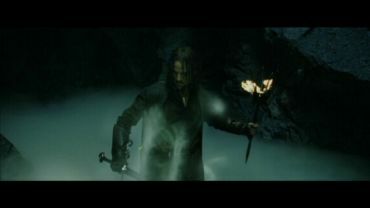 Aragorn walks off to light the fire that has gone out. 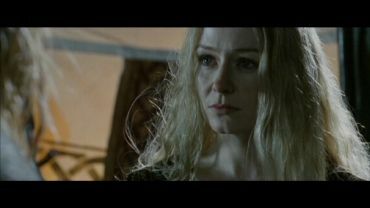 As he covers Éowyn with a coverlet, she wakes up and holds his hand. She tells him about the dream she had: standing in front of an abyss and seeing water covering all the green lands before her. 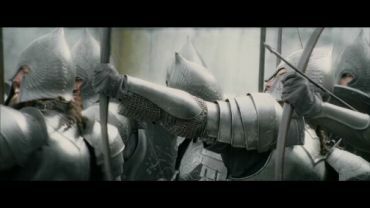 SEE: This scene is edited differently. 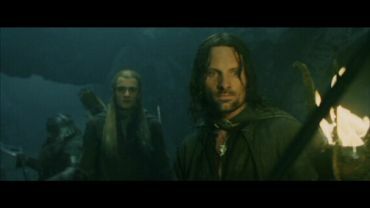 Aragorn stands next to Merry (shown from the back). 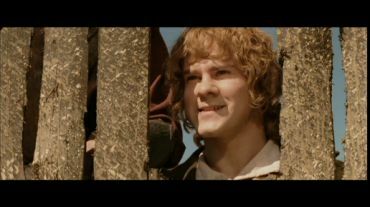 Merry tells that he and Pippin were always together, since they were children. 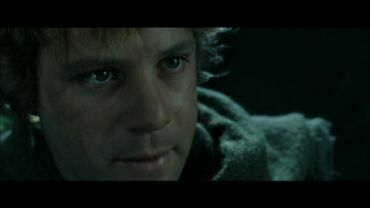 And he always saved Pippin from trouble. 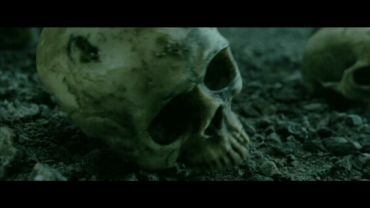 And now he is gone, just like Frodo and Sam. 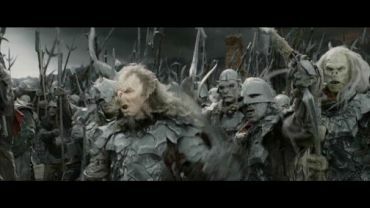 Aragorn answers that the hobbits are a brave folk. 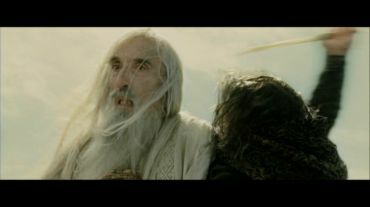 The two look at Gandalf riding away. 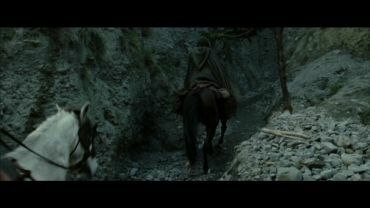 Theatrical version: Aragorn stands next to Merry, Shadowfax rides away, Aragorn looks at the rider. 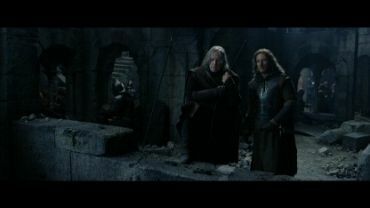 Theatrical version: Denethor gives Pippin a short look. 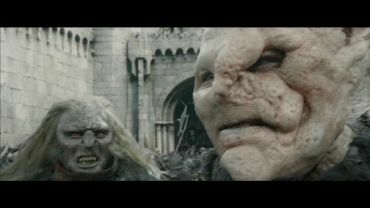 SEE: As they are walking off, Gandalf is angry at Denethor who has gone crazy and drives a thousand years old city into ruin. 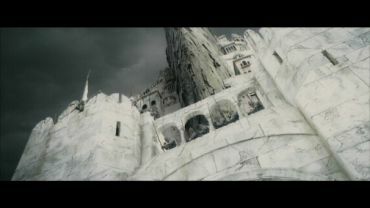 He and Pippin go to the “bow” of the palace square, and Gandalf tells Pippin about the decline of Gondor, how the line of the Kings was broken and the Stewards left the city to decay. 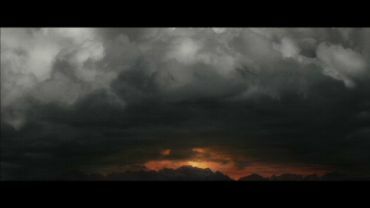 Pippin looks at Mordor lying just before them, and sees a gigant storm cloud above it. 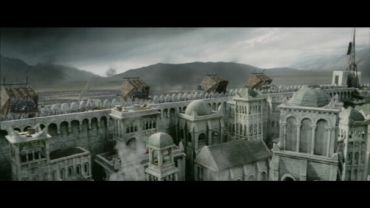 Gandalf says that when this cloud reaches the city, war will begin – and that nobody can leave Minas Tirith now. 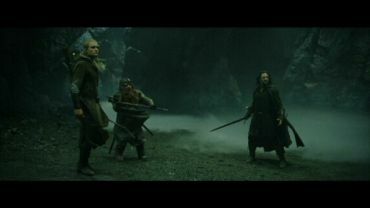 Change of scene: Frodo and Sam come to the Crossroads, led by Gollum. 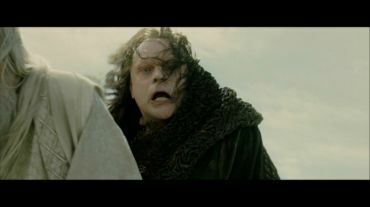 Frodo feels unwell, he has a feeling that he’s not coming back. 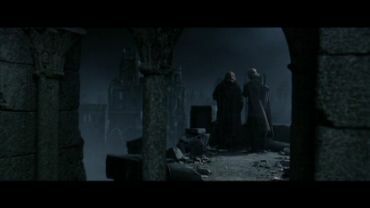 Sam comforts him: he would go there and back again, just like Mr. Bilbo. 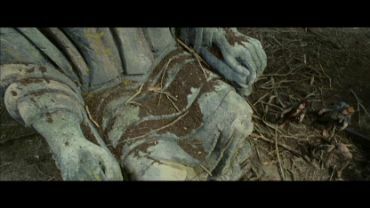 They come to a clearing with an old statue of the King, but with an ugly boulder instead of its head. 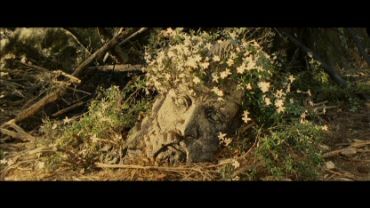 The head is lying in the bushes with flowers all over it. 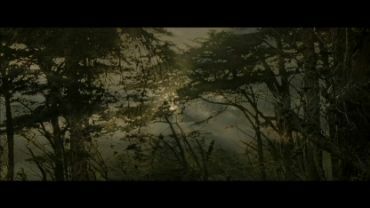 As the sun lights up the clearing, the head is flooded by sunlight and Sam says, that the King has his crown back on. 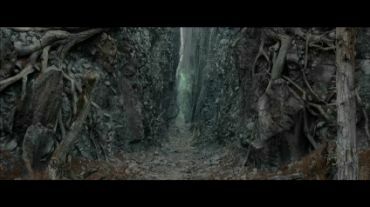 Than the sun disappears, and Frodo, Sam and Gollum proceed their journey. 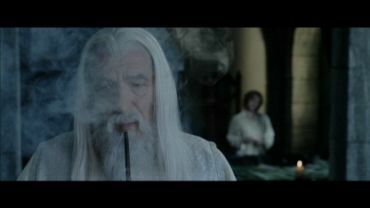 SEE: Gandalf coughs while he is smoking. 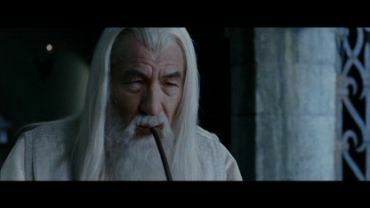 SEE: Gandalf sagt the same dialogue, however, he keeps coughing from time to time. 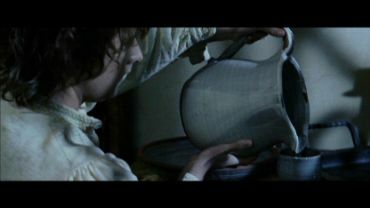 Pippin fills a jug of water and gives it Gandalf to drink. He looks at the sky and cannot see the stars. 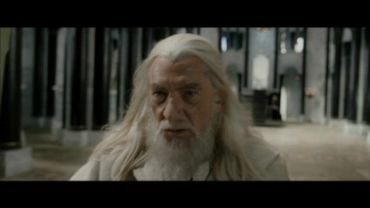 He asks Gandalf if it is the beginning of the war, and Gandalf confirms it. 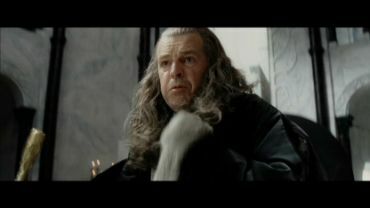 Theatrical version: Gandalf says that Peregrin Took is now in the service of the Steward and has to do whatever he is ordered. 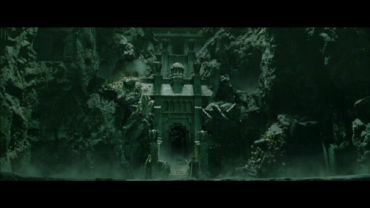 SEE: Gollum tells that the hobbits only have to run up the stairs and get to the tunnel. 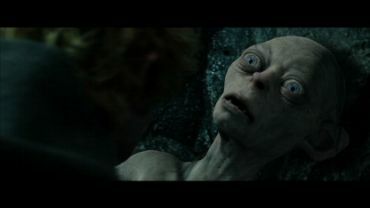 Sam grabs him and makes Gollum clear: if he felt something is not right, he would kill Gollum. 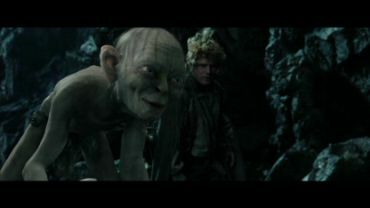 As Frodo asks what the matter is, Sam says that he just made something clear to Gollum. 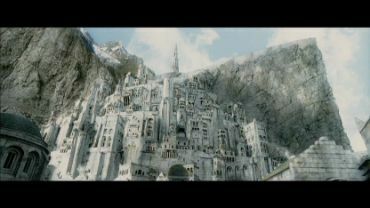 SEE: Osgiliath during the night. 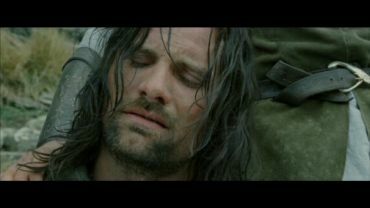 The soldiers of Gondor make a rest. 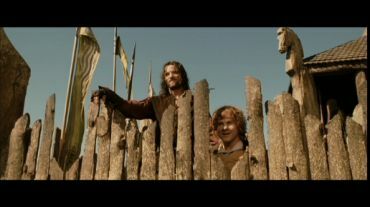 Faramir comes up to Mablung at a railing. 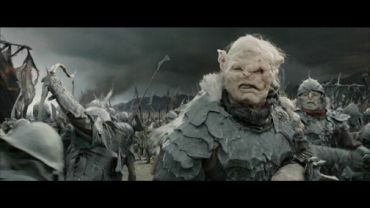 The latter reports that the orcs have been quiet. 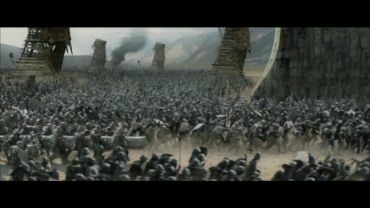 They probably intend an attack from the North. 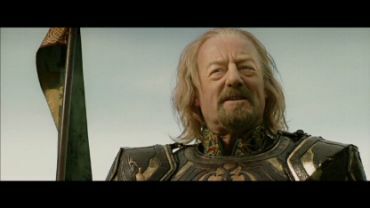 SEE: Merry offers his service to King Théoden. 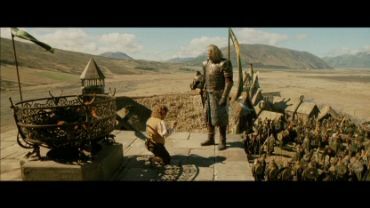 The latter accepts it gladly and calls him Meriadoc, the Squire of Rohan. 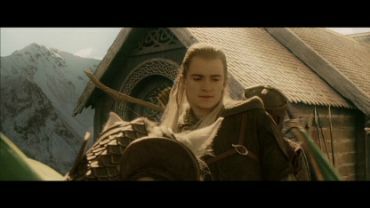 Gimli and Legolas are sitting on one horse. 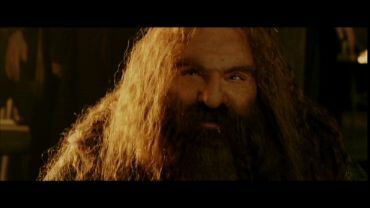 Gimli is grumbling, wishing he could bring a company of dwarves with him. 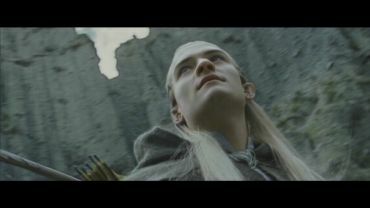 Legolas says that his people don’t need to move to war – the war is already moving over their land. Merry tries desperately to make his pony start moving. 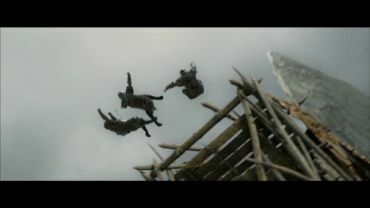 The scene with the pledge of loyalty appeared in the very first trailer of the film – and was kept from the fans more or less for the longest time. 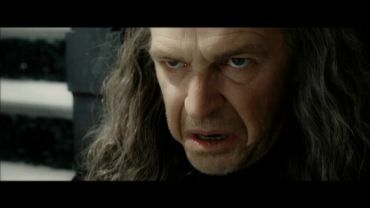 Denethor is mad at Faramir because he did not deliver him the Ring. 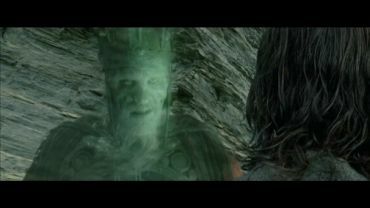 He accuses him of wanting to appear noble. 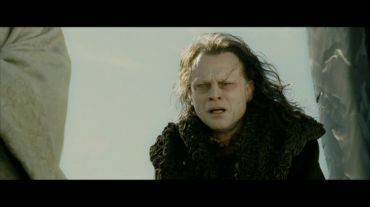 His brother would have brought him the Ring. 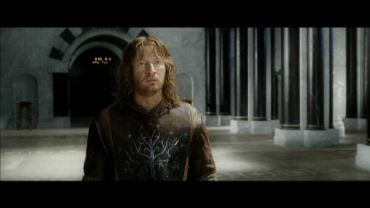 Faramir answers that Denethor would not have recognized Boromir if he had taken the Ring for himself. 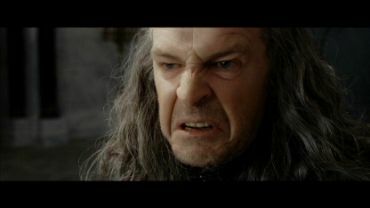 Denethor gets even more upset; he falls to the ground and has a vision of Boromir coming to him from behind Faramir’s back. 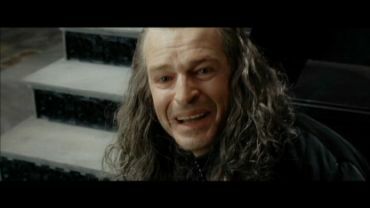 Denethor is smiling, but then the vision fades – and he angrily sends Faramir away. 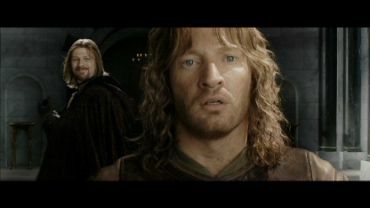 SEE: A new scene between Pippin and Faramir. 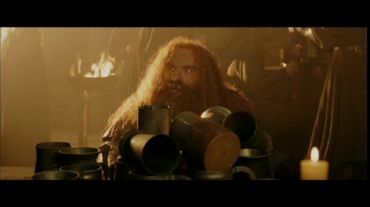 Pippin is sitting and thinking what service a hobbit can provide to a ruler. 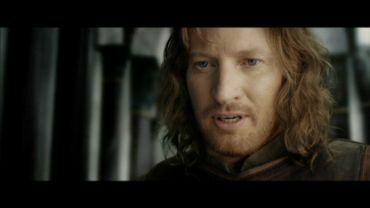 Faramir comes to him and says that one should not stop noble deeds by cold advice. 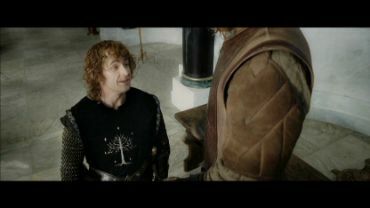 They talk about Pippin’s uniform which belonged to Faramir as a child. They laugh. 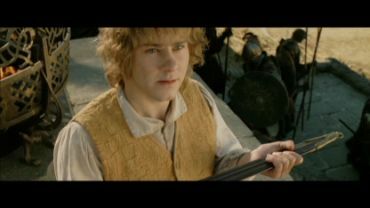 Pippin says that the uniform doesn’t fit too well. 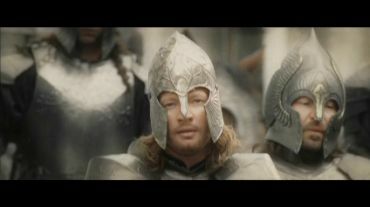 Faramir says that it didn’t fit him, either. His brother was more of a soldier, strong like his father. 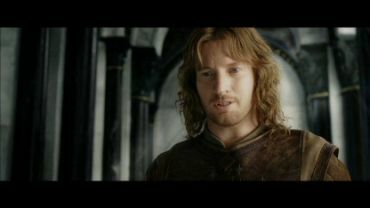 Pippin says that Faramir is also strong – in another way. 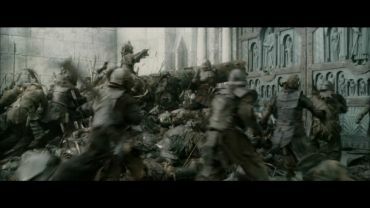 SEE: Faramir tells Gandalf that he would gladly sacrifice his life for saving this city. 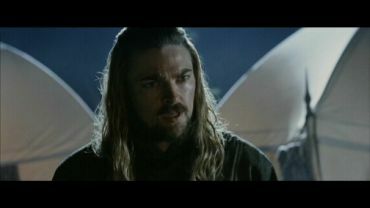 SEE: Éomer stands up and tells Éowyn that she know as little of warfare as Merry does. 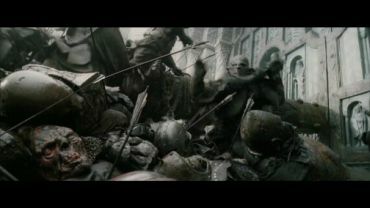 The hobbit, confronted with the cries and the suffering in the middle of a battle, would flee – and would be right to do so. War is a task for men. 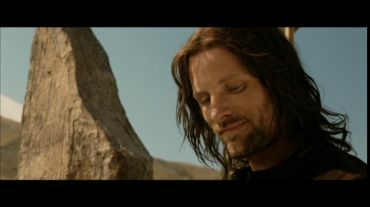 SEE: Aragorn tells Éowyn that he wished her luck since the moment he saw her first. He strokes with his palm over her cheek and walks away. 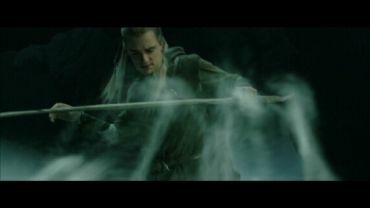 SEE: Legolas continues quoting the prophecy: an heir to the man to whom the Dead pledged loyalty, will enter the forbidden gate and summon them. 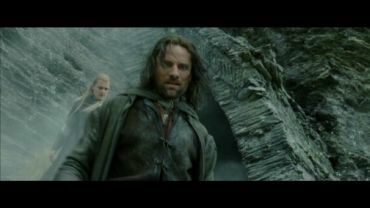 SEE: The Three Hunters walk over the Paths of the Dead in the cave. 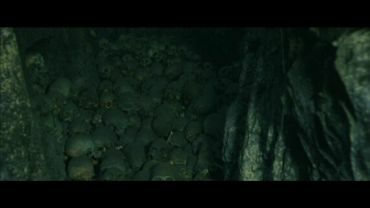 In a corridor they find a heap of human skullls. 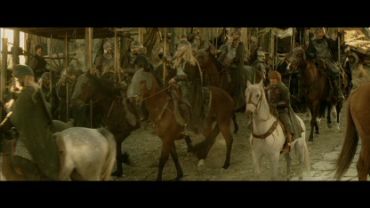 Legolas says that he sees a host of ghosts, with horses and pale banners, answering the call. As the three go on, they are surrounded by ghostly hands. 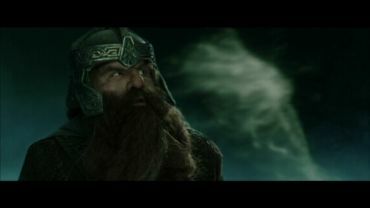 Gimli tries to blow them away. 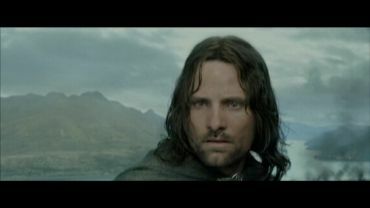 Aragorn feels a crunch under his foot and warns his friends from watching down. 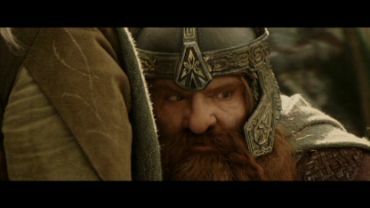 Gimli of course does look – and sees that they are walking on human skulls. 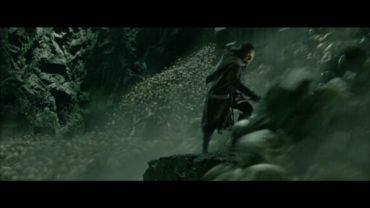 He goes faster, and each of his steps is accompanied by a loud crunch. 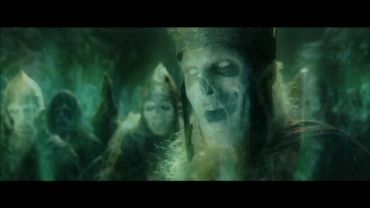 SEE: The King of the Dead starts laughing, the host of the Dead disappears. 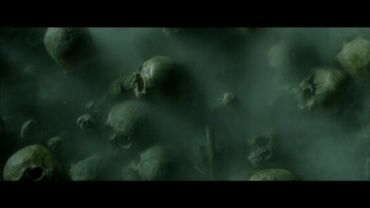 The crypt begins to crumble and comes crashing down – and out comes an avalanche of skulls. 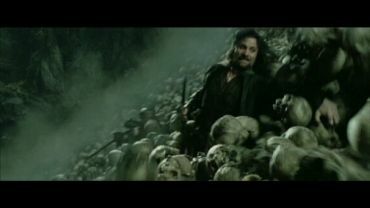 Aragorn, Legolas and Gimli struggle through hundreds of rolling skulls, escaping just barely. 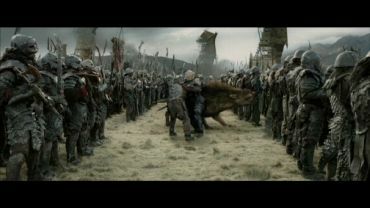 SEE: Gothmog steps off of his warg. 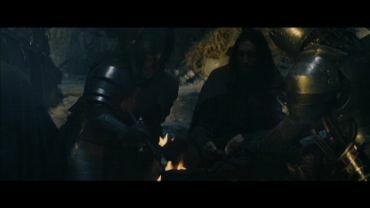 His adjutant tries to help him, but Gothmog pushes him away and walks on, hobbling. 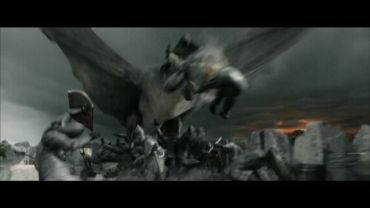 SEE: A Nazgûl flies along the fortress wall, as his fell beast grabs several soldiers with his claws. 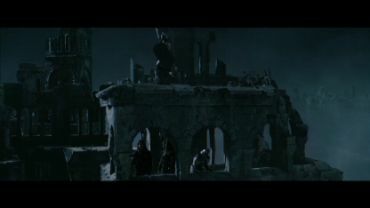 SEE: The orcs climb from the siege towers on the walls. The soldiers shoot some of them. 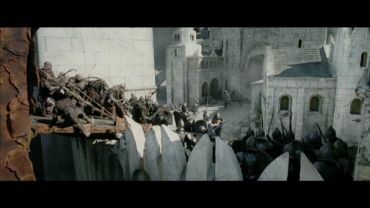 Meanwhile, a company of orcs attempts to attack the main gate with a battering ram. 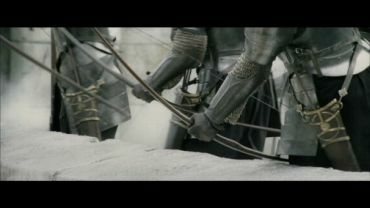 However, many of them are killed by the archers from the walls. 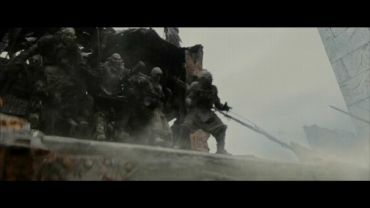 SEE: Another siege tower opens its hatch and orcs jump out. 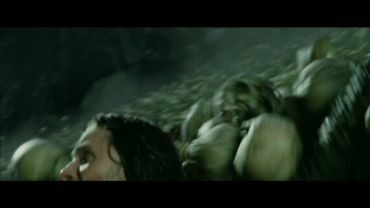 SEE: The orcs continue trying to break the gate with the ram. Meanwhile, there is a pile of them lying dead on the ground. The archers keep taking them out from up the wall. 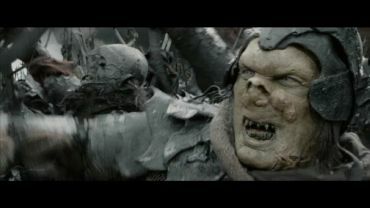 Gothmog is displeased and insults his orcs. 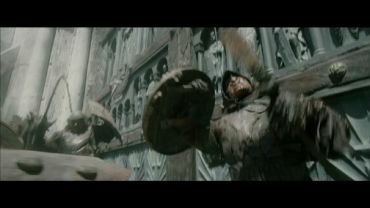 He orders an orc to break through the gate. 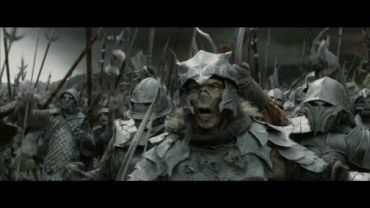 The orc replies that it’s too strong. 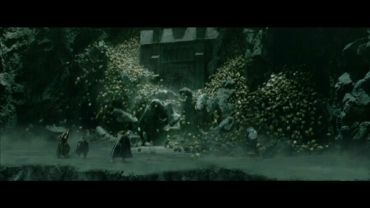 Gothmog says that Grond will break it. 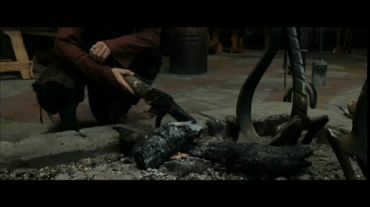 He orders to bring in the Wolf’s head. 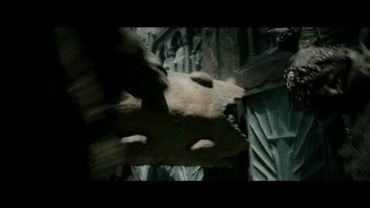 Theatrical version: 3 Frames more can be seen of the “Great Beast” pulling the Grond.